New Jersey Gov. Chris Christie sits with students during a gathering at Colin Powell elementary school in Union City, N.J. on Tuesday. New Jersey Gov. Chris Christie denied knowing about a scheme orchestrated by his administration to bully a local political rival, calling the reported actions of a top aide "unacceptable." He vowed to hold members of his administration accountable. Christie said he was previously unaware of apparent actions taken by his deputy chief of staff to orchestrate the controversial closure of local access lanes to the congested George Washington Bridge in Fort Lee, N.J., in the midst of a re-election campaign. The action prompted massive traffic gridlock in the city on its first day of school. "What I've seen today for the first time is unacceptable," Christie said in a statement. "I am outraged and deeply saddened to learn that not only was I misled by a member of my staff, but this completely inappropriate and unsanctioned conduct was made without my knowledge." The explosive emails by Bridget Anne Kelly to Port Authority aide David Wildstein were made public by news organizations on Wednesday, and contradict previous assurances by Christie that his administration was not involved in the lane closures, and that they were not politically-motivated. Democrats have charged the closures were an attempt at political retribution for Mayor Mark Sokolich, a Democrat who declined to endorse Christie's re-election effort last year and whose city sits in the shadow of the bridge. But the emails threaten to undercut the governor's strong denial that politics played any role in the closure. "Time for some traffic problems in Fort Lee," Christie Deputy Chief of Staff Bridget Anne Kelly wrote to Christie Port Authority aide David Wildstein on Aug. 13, weeks before the lane closures that snarled traffic on the first day of school in New Jersey last fall. The exchange has erupted into a political firestorm for Christie, a top contender for the GOP presidential nomination in 2016, because it cuts at key elements of his appeal: his ability to work with Democrats, and his brash style of politics. "Is it wrong that I am smiling?" NBC's Mark Murray and MSNBC's Steve Kornacki discuss the latest developments on the Chris Christie "Bridgegate." Person: "I feel badly about the kids. I guess." Wildstein: "They are the children of Buono voters." Buono is the Democrat whom Christie defeated in last year's gubernatorial race. Christie had previously denied involvement with the lane closures, and "absolutely, unequivocally" denied that the closures were politically motivated after accepting the resignation of a top port authority official in December. He also maintained that members of his administration had assured him that they were not involved with the lane closures. In response to the revelations, Buono, Christie's former challenger in last year's gubernatorial investigation, called for a federal investigation. "Everyone who had knowledge of the closing should be terminated immediately and the Department of Justice should conduct a thorough investigation to determine whether other towns in New Jersey suffered because the Governor wanted to get revenge," Buono said in a statement Wednesday afternoon. Ahead of his reelection last fall, Christie was seeking endorsements from North Jersey Democrats to promote his ability to forge bipartisanship. Christie and his team did attract several endorsements from North Jersey Democrats, but there were some holdouts, including the Mayor of Fort Lee, just across the Hudson River from Manhattan. One day last September, two bridge access lanes to the George Washington Bridge from Fort Lee were cut off – a bridge that is the busiest in the world, according to the Port Authority. New Jersey Port Authority officials said it was for a traffic study. But the mayor of Fort Lee charged that it was political retribution for not endorsing Christie, something thought to be a far-flung charge. That is until a hearing looking into the matter in December seemed to give some credence to that theory. A New York Port Authority official testified that he was unaware of any such study. 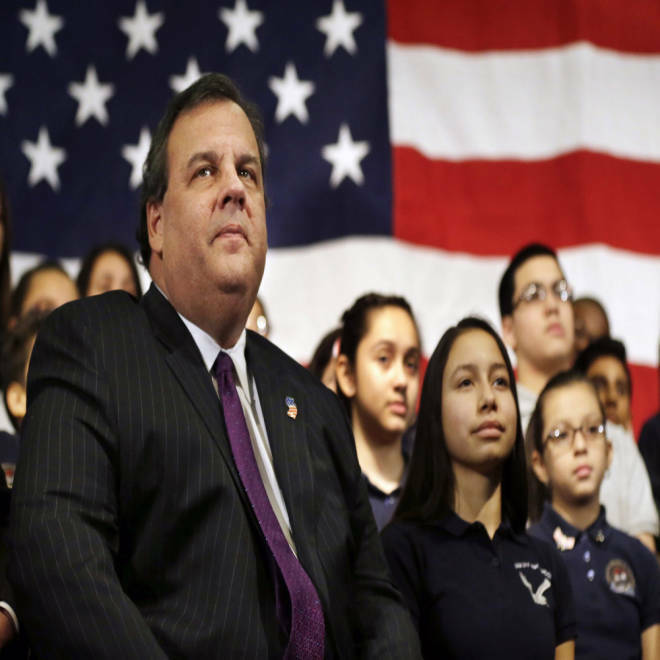 Two Christie appointees wound up resigning. Now these emails, released to state investigators by subpoena, reveal the greater depth to which Christie aides sought payback against Fort Lee Mayor Mark Sokolich, derided by one Christie aide in the released emails as a “little Serbian” and threatening that “it will be a tough November” for him. NBC New York and other news outlets report that Wildstein supplied the exchanges in response to a subpoena by state lawmakers investigating the lane closures. Wildstein, the former port authority's director of interstate capital projects, resigned in December shortly before Bill Baroni, the deputy executive director of the New York-New Jersey Port Authority, also resigned. Here's the link to the emails and text messages.